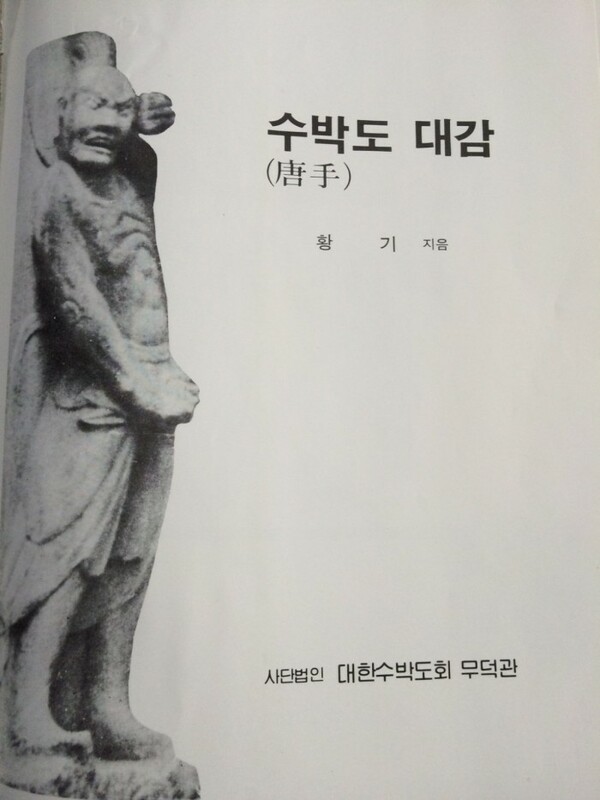 1970 April : Authored & published Soo Bahk Do Dae Kham (Korean Version). 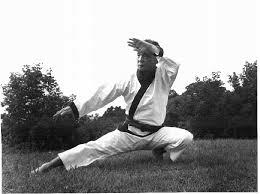 Ja Yu Dae Ryun Shim Sa at the 46th Dan classing on September 27, 1970 in Detroit, Michigan. 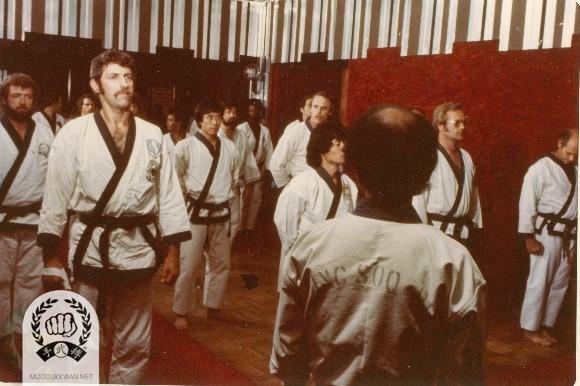 Chuck Norris (2819) is shown (facing forward) and Loren Adams (12941) is shown (facing backward). 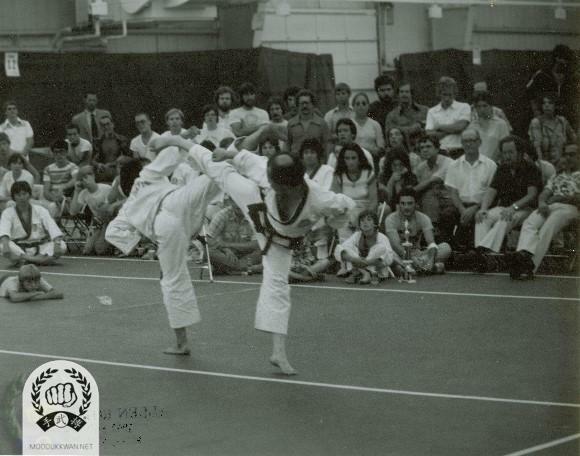 E Dan Yup Podo Cha Gi demonstration through fire ring during the 46th Dan classing Shim Sa on 1970, Detroit, Michigan. Ja Yu Dae Ryun between C.I. Kim (475) and Dale Drouillard (757) during the Dan testing in Detroit, Michigan in 1970. 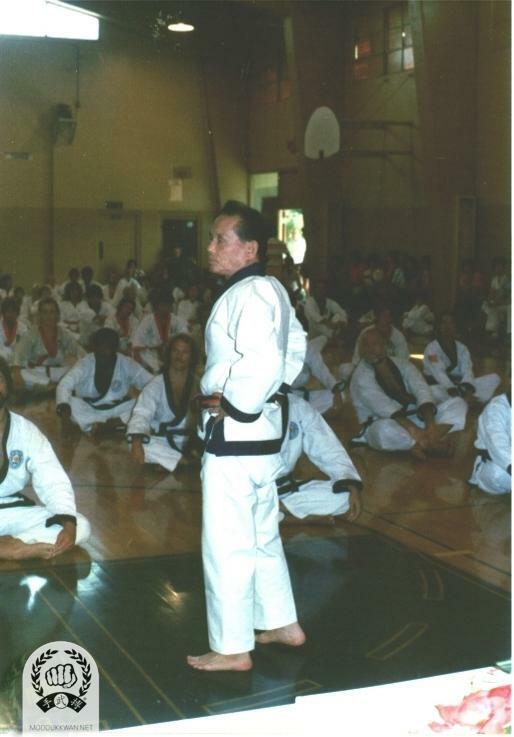 Conclution of the 46th Classing Dan Shim Sa. Hwang Kee KJN, Kyung Won Ahn(1763), C.I. 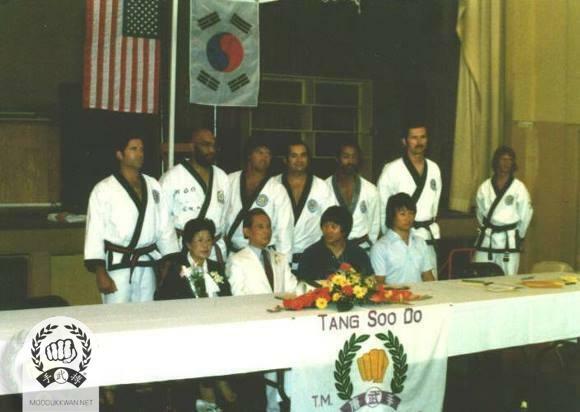 Kim(475), Song Hwan Chung(2231), Chuck Norris(2819), Pat Johnson(6971), and Loren Adams (12941) are shown in this photo. 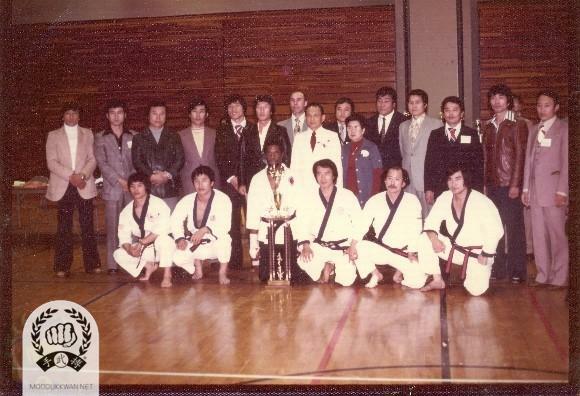 The Korean team for the 1st World Karate Union which was held in Tokyo, Japan. 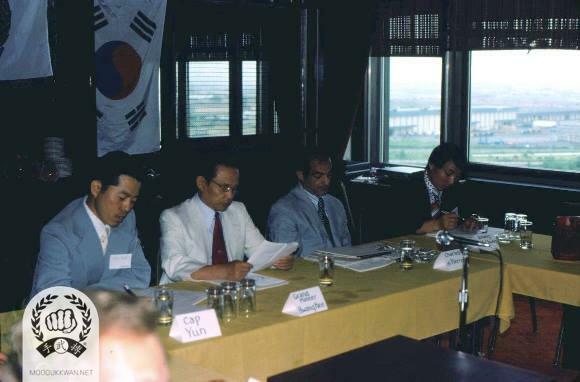 Chun Sik Kim (2457), Col. Han, Hong Rae Kim, H.C. Hwang(509), Kang Uk Lee(70) in standing and Boem Ju Lee (11870) and Duk Soo Choi (3682 ) in sitting are shown in this photo. 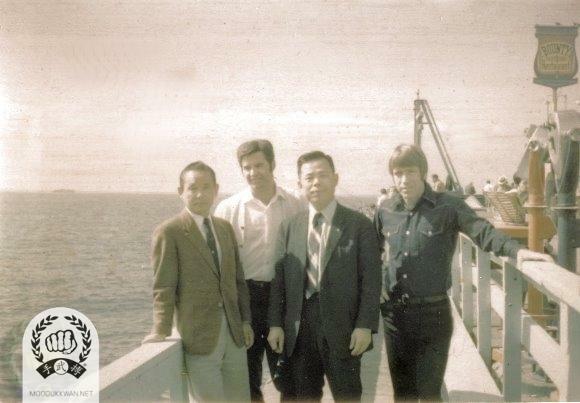 Hwang Kee KJN visit with (from left) Vic Martinov (10189), Jae Joon Kim (38), and Chuck Norris (2819) in California during 1970. 1973: Awarded “Da Ma Roo” from Philippines President Marcos. 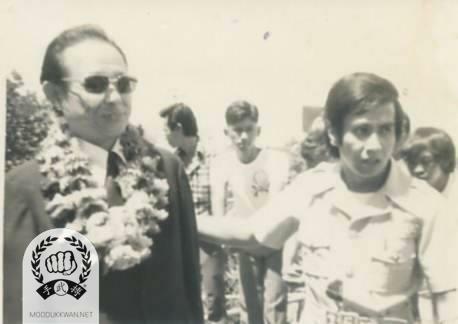 Founder arriving in the Philippines. 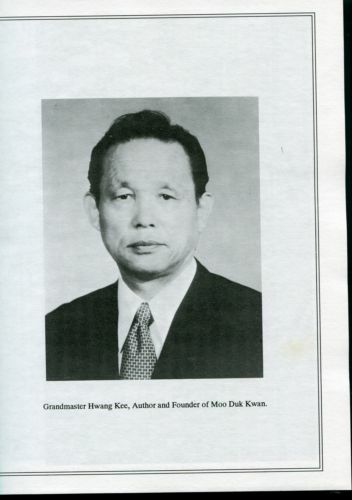 Hwang Kee KJN's visit to Miri, Sarawak, Malaysia in 1970. 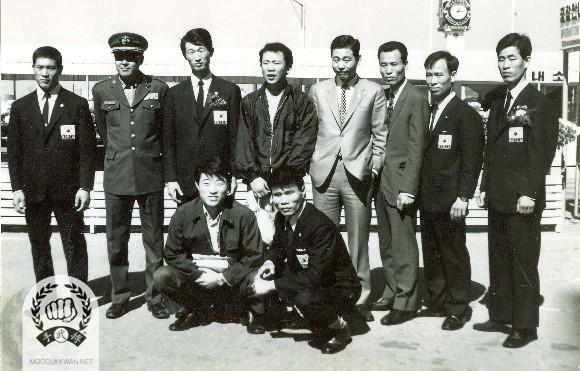 1973 May: Dispatched HC Hwang (#509) to Greece. 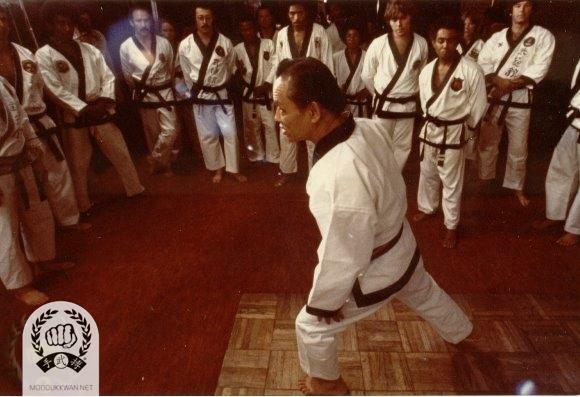 1974 March: Established Moo Duk Kwan in Belgium (Instructor: B.J. Lee (11870). USA members at Burlington, NJ. 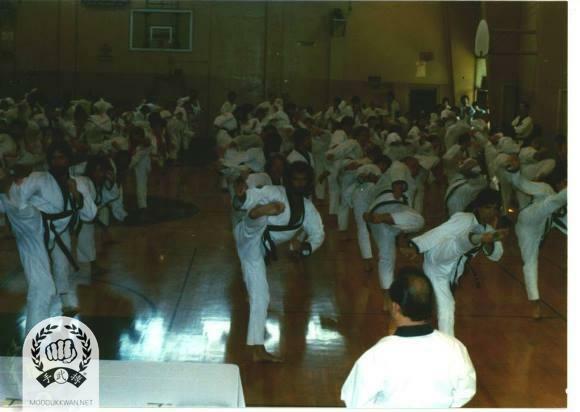 Moo Duk Kwan directors convention and general meeting of all USA members at Burlington, NJ. 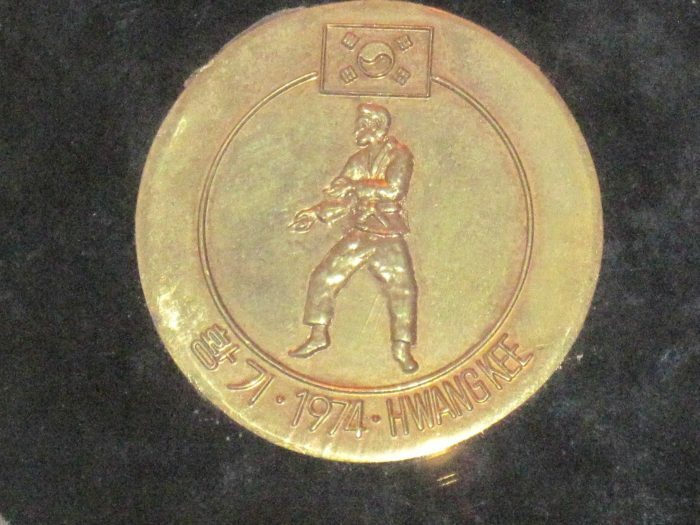 Photos below are of the Founder's Coin from 1974. The Founder used to hand out these types of coins on certain events. This particular coin is believed to have been handed out during the 1974 Directors and General meeting in Burlington, NJ, that meeting was to establish a national convention in 1975, which led to the formation of the U.S. Federation. 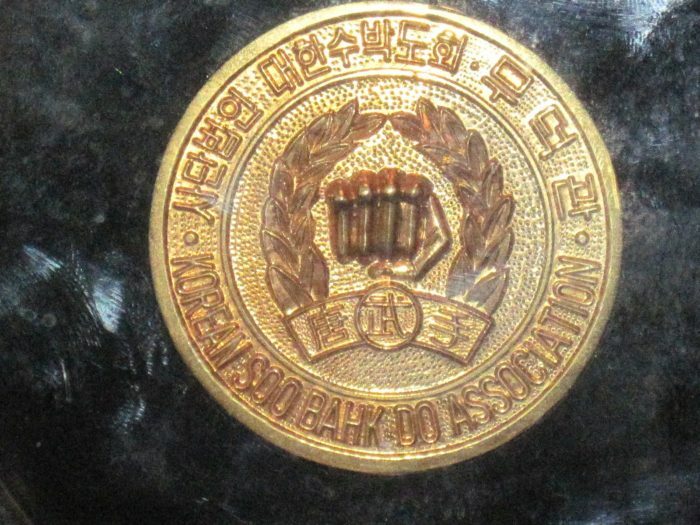 This back of the coin shows the founder performing O Ship Sa Bo hyung. 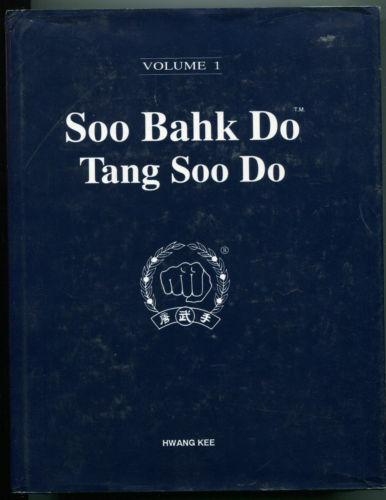 The front of the coin shows that the Korean Soo Bahk Do Association was established prior to 1974. 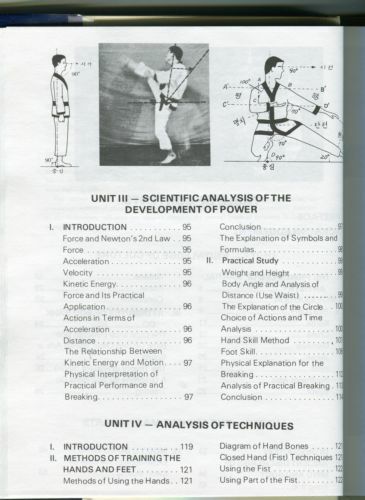 (It was incorporated in 1960). 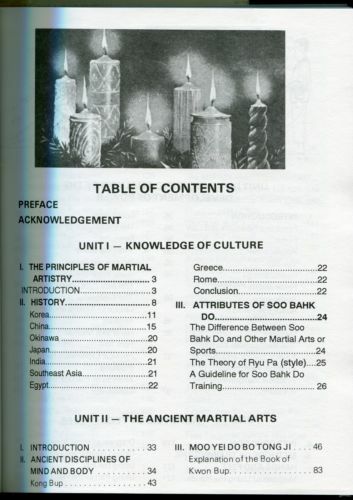 United States Soo Bahk Do Charter convention and special seminar by Grandmaster Hwang Kee (Hilton Hotel, NY). 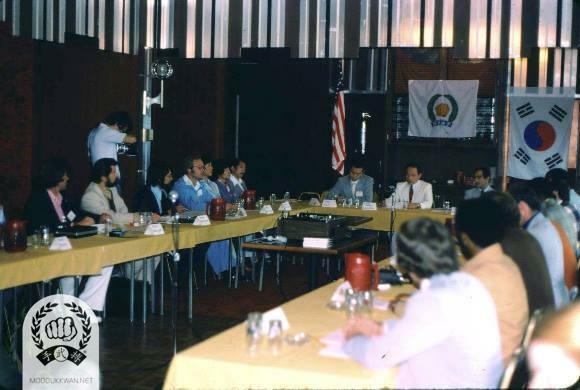 The founder's clinic at the 1975 Charter Convention for the US Federation. 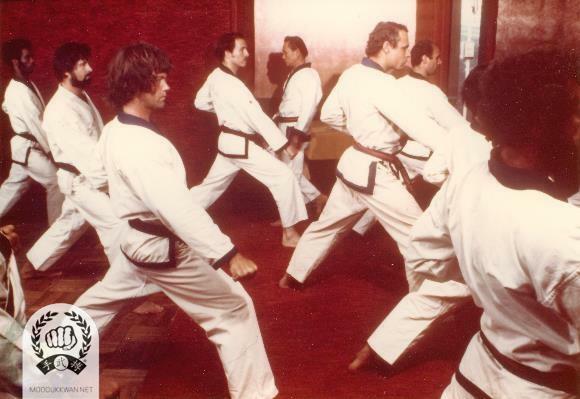 The founder, Ben Cortese (11689), Robert Beaudoin (5661), Robert Shipley (4825), Ron Savage (15879), Victor Martinov (10189), Fred Kenyon (14345) are seen in this photo. 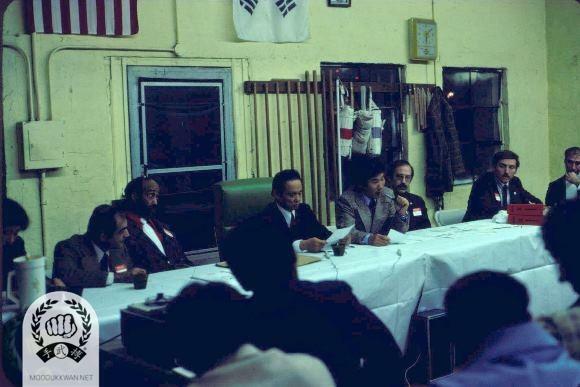 The founder's clinic at the 1975 Charter Convention. 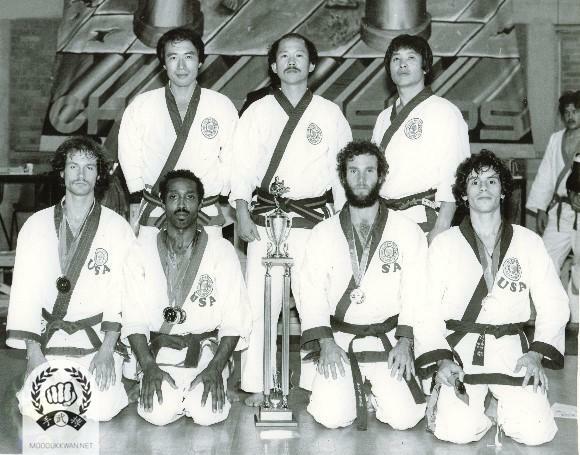 The founder, Russ Hanke (4137), Andy Ahpo (10187), Frank Trojanowicz (13333), Ron Savage (15879), Robert Rondelli (17416), Greg Williams (11695) are seen in this photo. HC Hwang (509), Larry Seiberlich (1815), Ki Yol Yu (5311), Joe Weeks (3596), James Ruston (4130), Russ Hanke (4137), YK Hong (4142), Robert Shipley (4825) are seen in this photo. 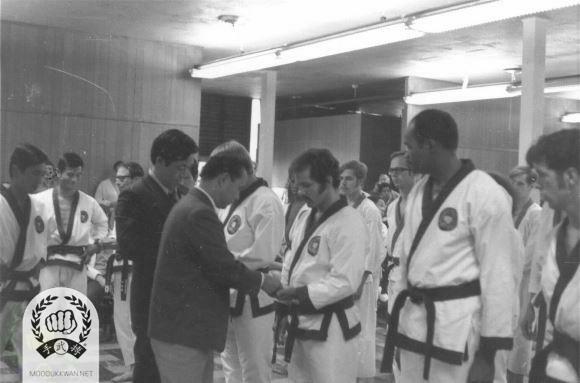 The founder at the clinic for the 1975 Charter Convention. The Charter was ratified making this event the official birth of the U.S. Federation. The 1975 US Charter Convention clinic: Stand Rear; Robert Rondelli (17416), Psyche Smith (18143), James Lee (14317), Greg William (11695), Carl Jenkins (18983), Ron Savage (15879), Dennis Miller (18430), Peter Canciani (18911). Stand second row; CS Kim (2457), Paul Johnson , Warren Adams , Jeff Moonitz (17650), Andy Ahpo (10187), Joe Weeks (3596), Frank Bonsignore (15805), Arthur Pryor (16505)), Benjamin Cortese (11689), Larry Seiberlich (1815), HC Hwang (509). 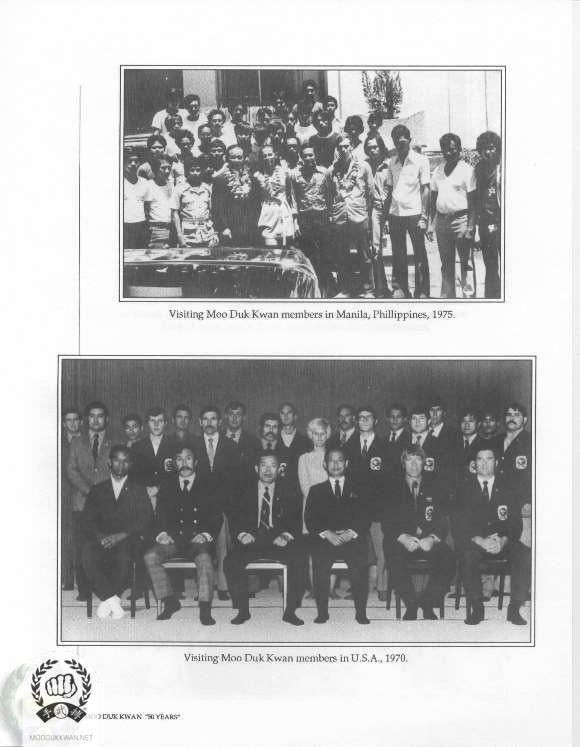 The 3rd row seated; Robert Fernandes, Jr.,(17927), Holly Whitehouse (18943), Robert Fernandez, Sr. (14464), The founder, James Rushton (4130), Victor Martinov (10189), Fred Kenyon (14345), Young Ki Hong (9193). Bottom row seated; Joyce Keyes (19448), Russ Hanke (4137), Robert Beaudoin (5661), Ki Yul Yu (5311), Frank Trojanowiz (13333), Robert Shipley (4825). 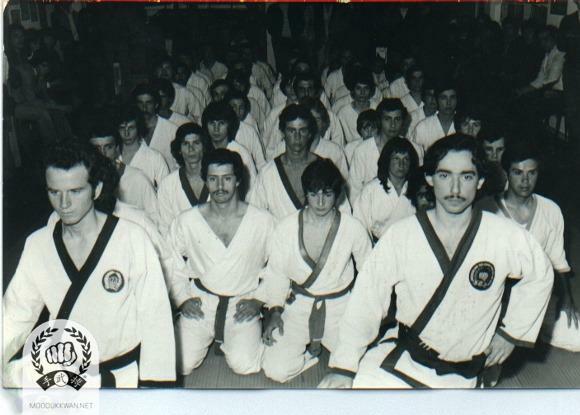 1974 November: Participated in first Pan-Hellenic Martial Arts Championship in Athens, Greece. 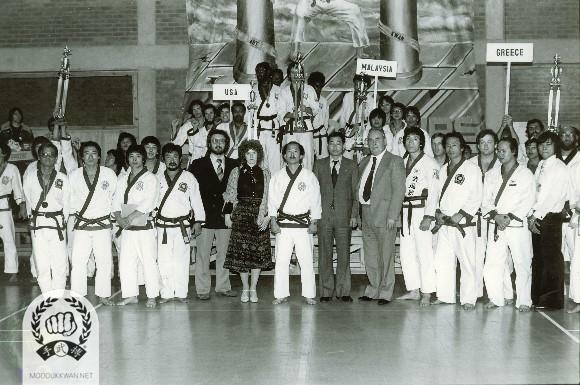 The founder and Mrs. Hwang Kee's visit to Greece during 1978. 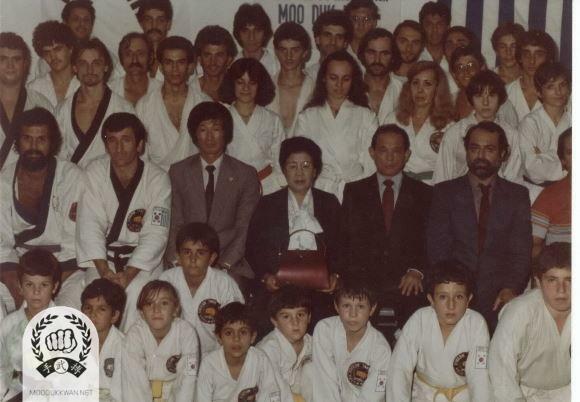 Nick Zouraris (21539), Anastasios Metaxas (20680), George Mallios (21910) Hong Rae Kim (8914), Mrs. Hwang Kee, The founder, John Polychroniou (20681) are seen in this photo. 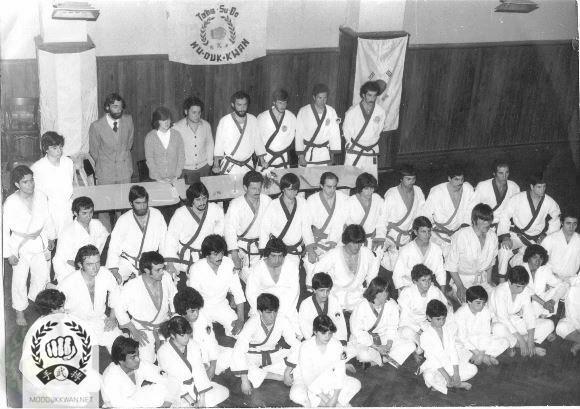 Moo Duk Kwan members in Buenos Aires in Argentina during 1978. Roberto Villialba (16519) is standing at the center of upper line. Group photo after ending ceremony at the 3rd Internationals in Watford, England. 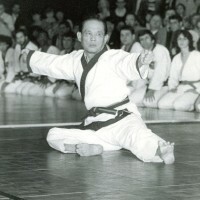 Yong Ki Hong (9193), Chun Sik Kim (2457), Eung Kyo Han (1369), HC Hwang (509), Kang Uk Lee (70), Dong Mun Kim (3167), Pal Yong Lee (549), Stephen Coleman (17656), Anthony Ooi (16518), George Wilson (20501), Louis Loke (23436), A Metaxas (20680), George Page (11772) are in the standrole. 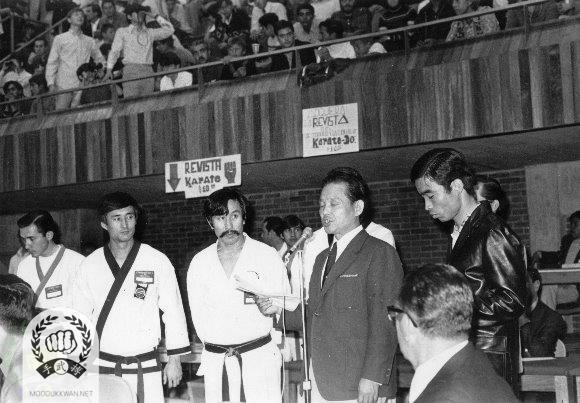 Hwang Kee KJN's opening speech at the Mexican National Championships in Mexico City, Mexico in 1970. 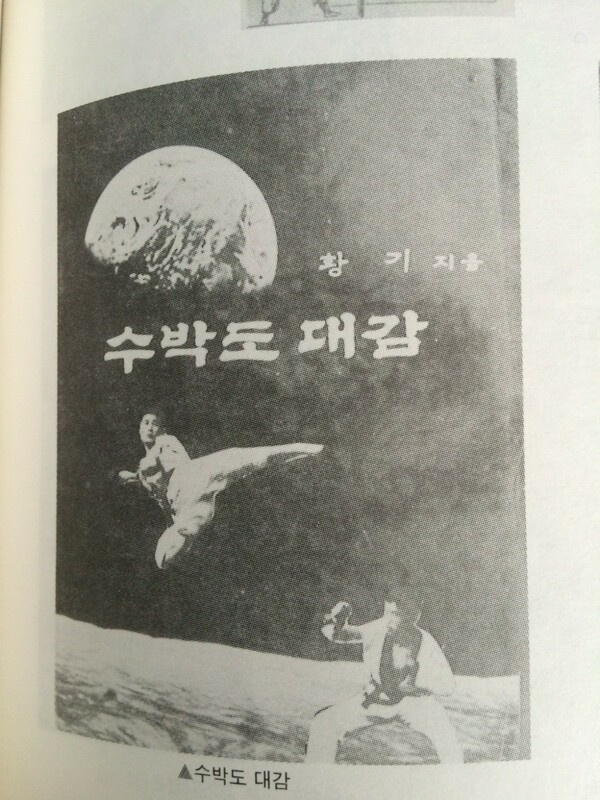 Jack Hwang (2506) and Dae Won Moon (2184) are shown in this photo. USA Team with officials; Seated from left: Brent Laymond , Lloyd Francis (12924), Doug Pratt (18941), and Gary Cholakian . 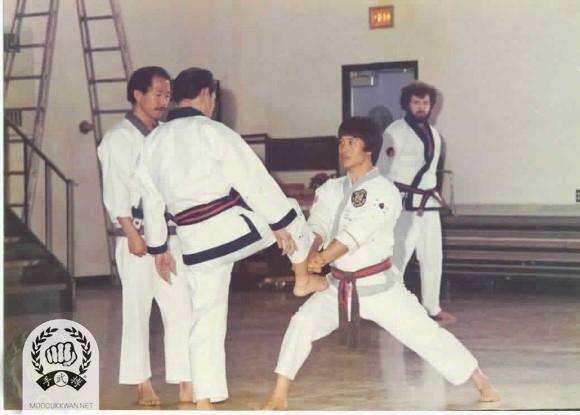 Standing from left: YK Hong (9193), HC Hwang (509), and CS Kim (2457). Team member Gary Tarr (20576) is not in the photo due to medical check up. 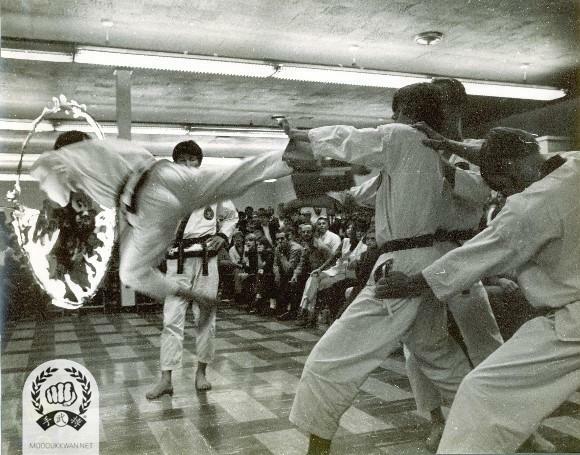 The founder's clinic in Detroit, MI in 1976. 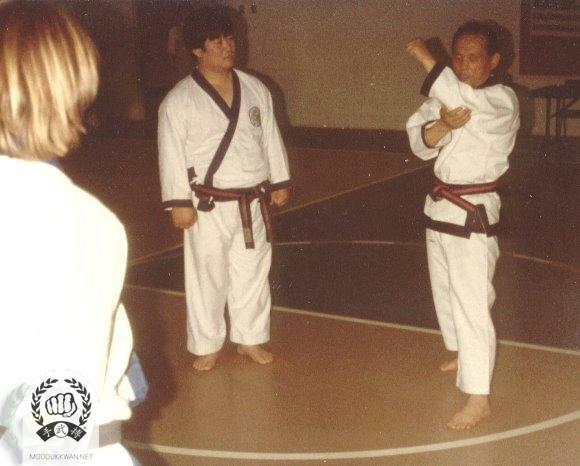 From left; HC Hwang (509), The Founder, CS Kim (2457), and Russ Hanke (4137). 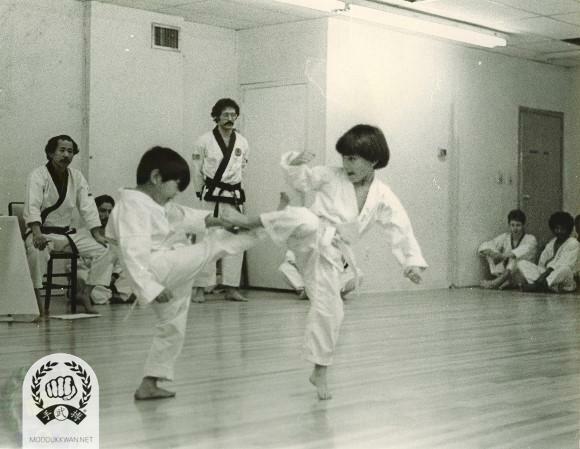 Children's free sparring at the Gup Shim Sa in 1976, Frank Bonsignore (15805) and H.C. Hwang (509) are seen in the background. 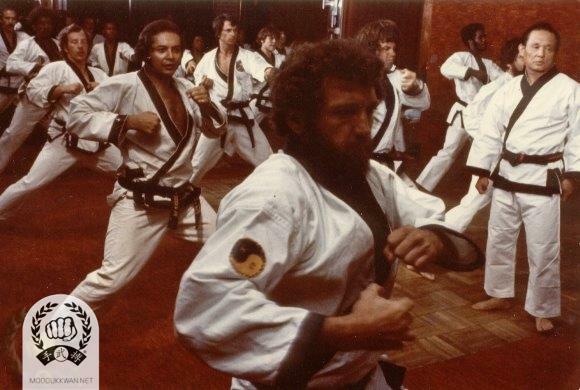 1977 January 19th: Korean Tae Kwon Do Association established a policy to eliminate the traditional and historic names of the Kwan's. and to identify them by number. 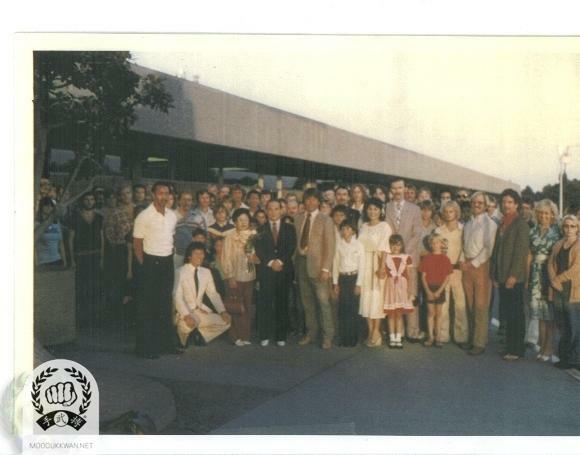 The founder's visit to San Diego, CA in 1977. 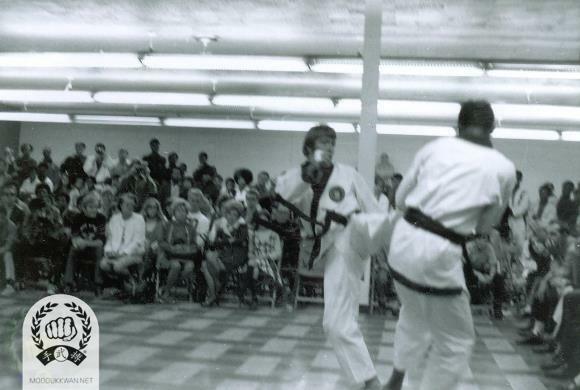 1977 May: Organized and conducted special National Tang Soo Do Moo Duk Kwan Championship at Concord Hotel, Monticello, NY. 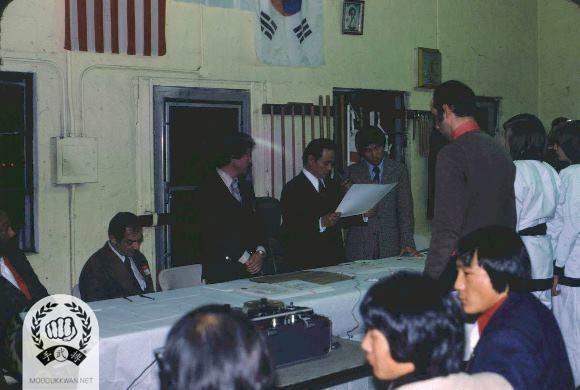 During the begining ceremony of the 1st US National Championship which was held at Concord Hotel in Monticello, NY in 1978. HC Hwang (509), CS Kim (2457), YM Lee (5562), MA Walsh (17926), A Pryor (16505) are shown in the photo. 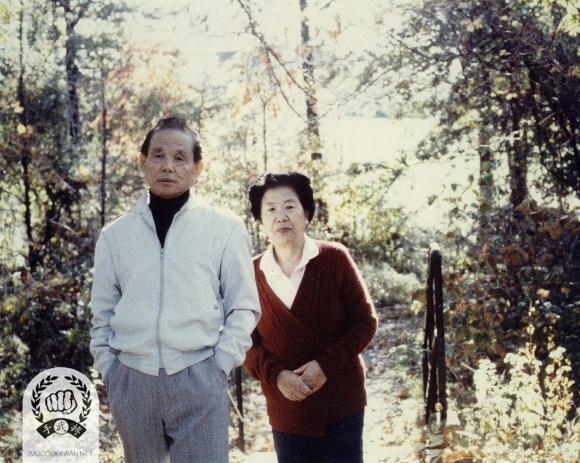 The founder and Mrs. Hwang Kee at the end of tournament in 1977 in Connecticut. Front row with Do Bahk; CS Kim (2457), Young Man Lee (9381), Grand Champion of the tounament, Young Ki Hong (9193), HC Hwang (509), and Ho Soo Hwang (9383). 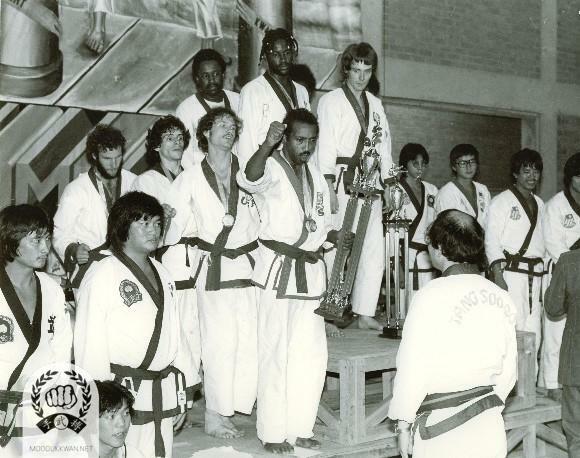 1978 October: 3rd World Soo Bahk Do Moo Duk Kwan Championship at London, England. Team trophy awarding ceremony at the 3rd Internationals in Watford, England. 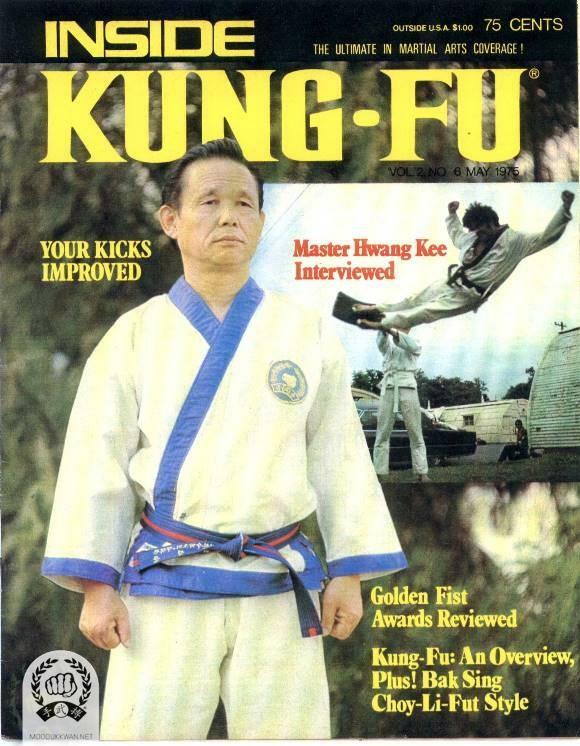 1978 November 9th: Hwang Kee turns 64. The founder and his wife at their 50th years of wedding anniversary 1978. 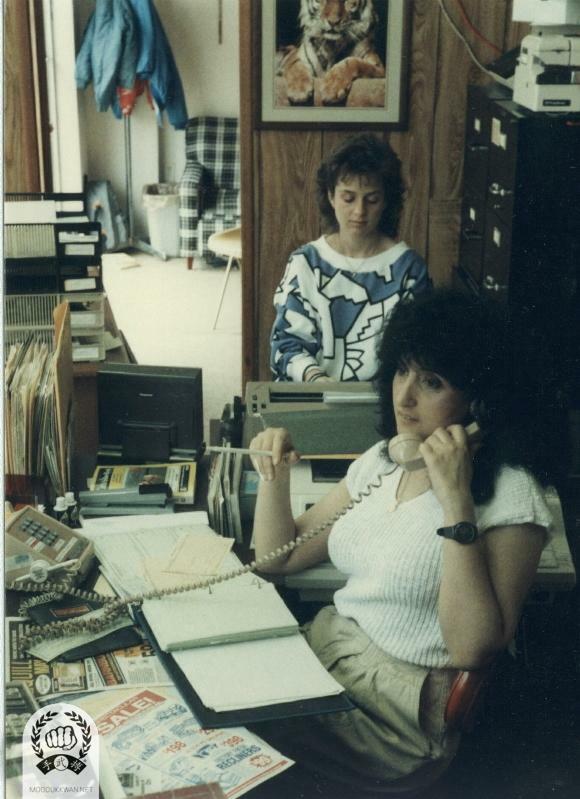 US Headquaters office in Springfield office during the 1978. Natalie D'Alessio, and April Pampalone, and Danny are showing at the photo. 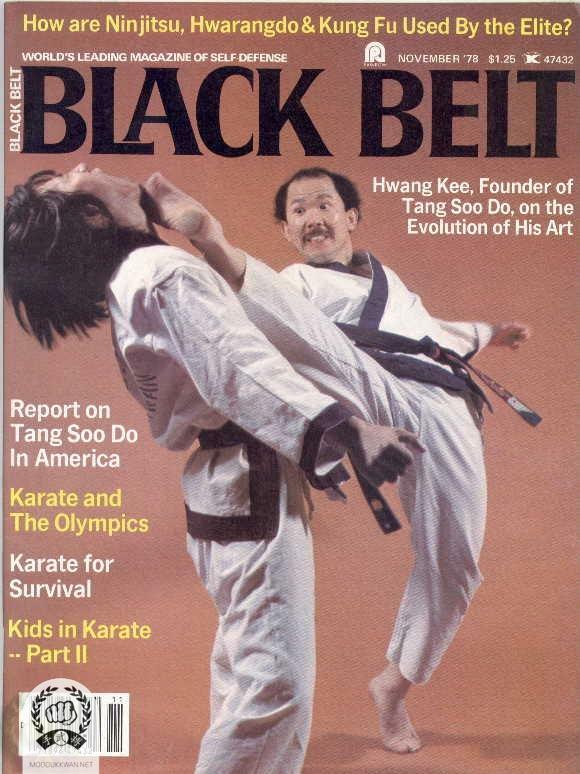 H.C. Hwang, Current Kwan Jang Nim, is featured on the cover of Black Belt Magazine in 1978. The founder's visit to Santa Barbara, CA. 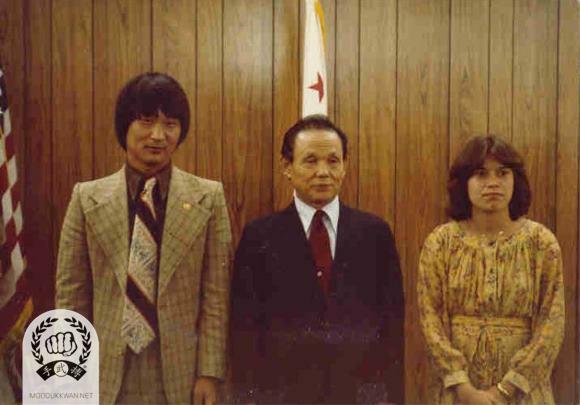 Jong Sook Lee (1370) and Marlene Kachevas (20786) are with the founder. 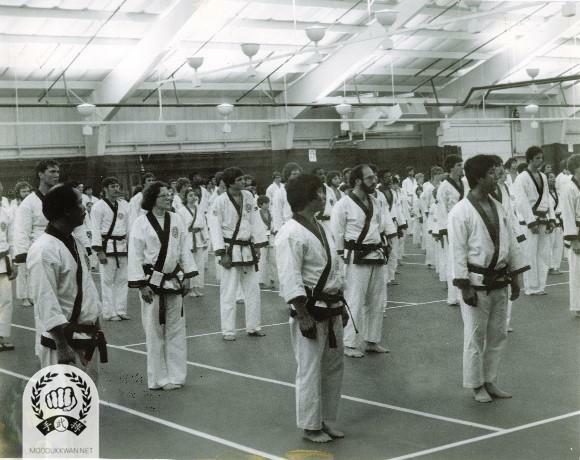 The Founder's clinic in Texas during 1979. Wha Yong Chung (410) is assisting the clinic. 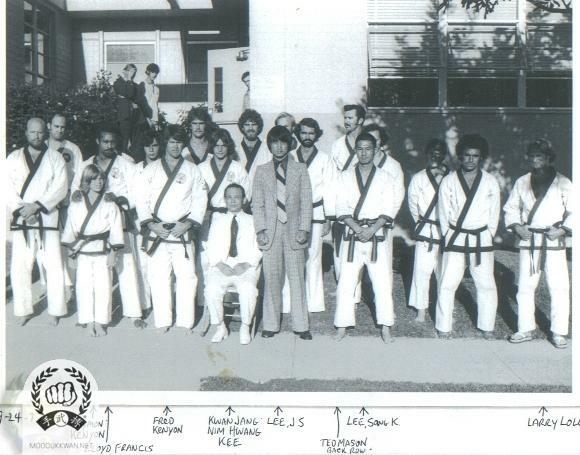 The founder's clinic in California during 1979. 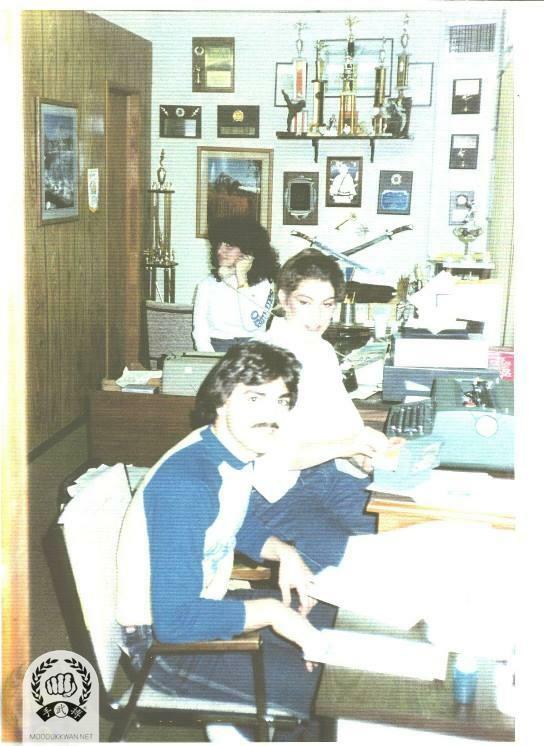 The founder's clinic in California during 1979. CS Kim (2457) is assisting the clinic. 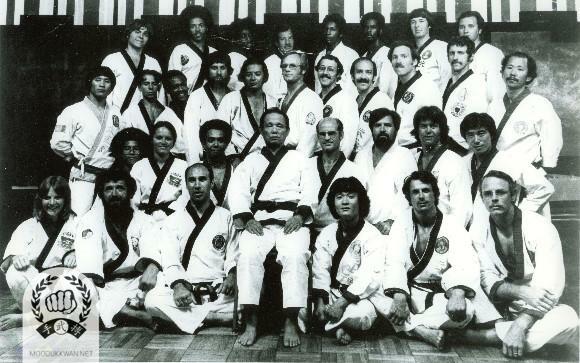 The founder's clinic in California, USA during 1979. 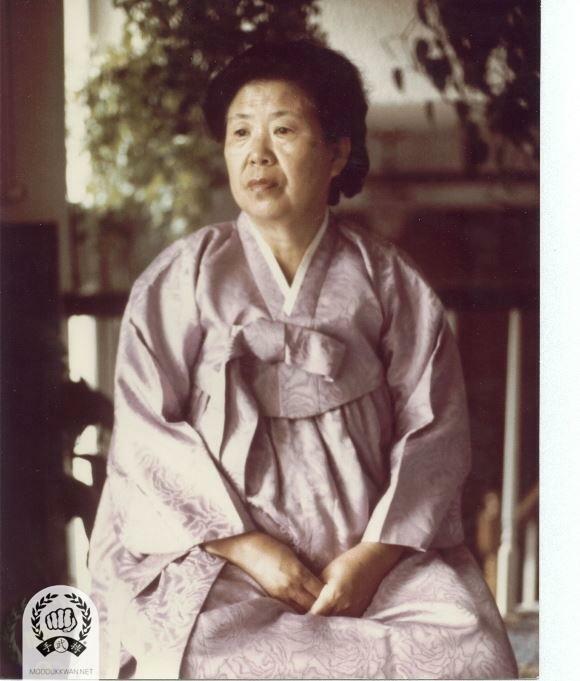 Mrs. Hwang Kee (maiden name: Cho, Kyong Kap) during 1979. 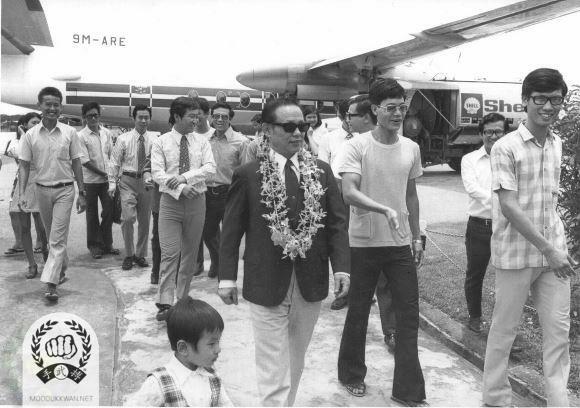 The founder's visit to US Region 9 in 1979. 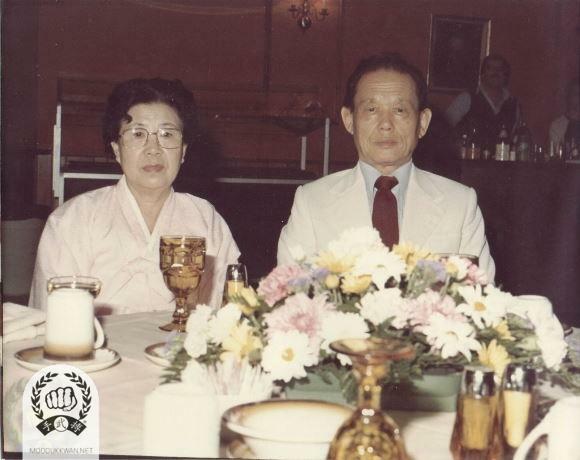 Sitting from the left: Mrs. Hwang Kee, Founder, CS Kim (2457), JS Lee (1370). Standing from left: Vic Martinov (10189), George Page (11772), Fred Kenyon (14345), Andy Ah Po (10187), Lloyd Francis (12924), Ted Mason (12895), and Terry Updike (18480). 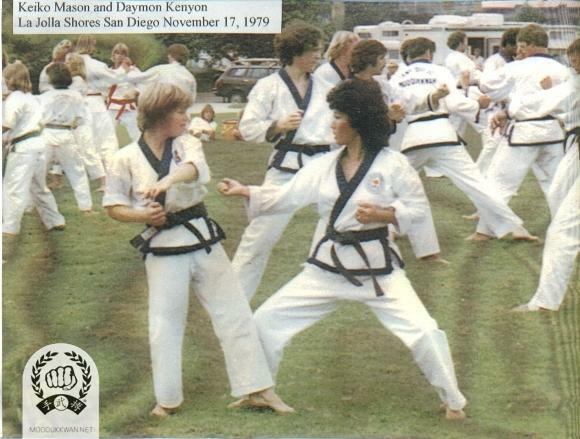 Keiko Mason (19023) and Daymon Kenyon (19839). 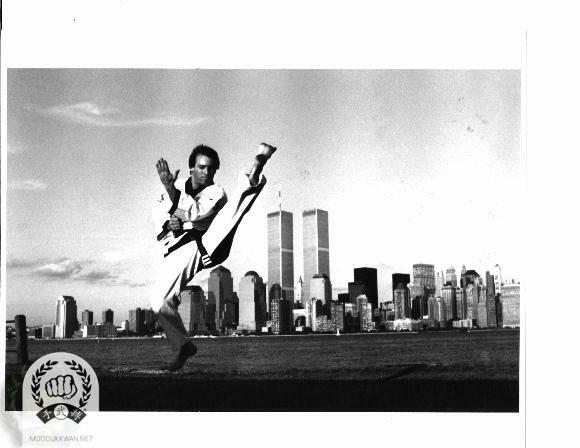 Lou Legregin (26015) is performing E Dan Pit Cha Gi in Jersey City, NJ during 1979. 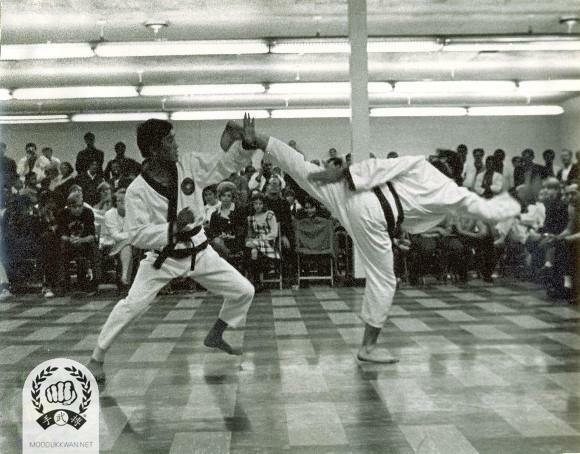 Began training in 1967 at the age of 16, as a member of the Brooklyn Highland Park Y.M.C.A., under the guidance and training of Mr. Mike Masley, Jr., Dan Bon 10180, and tested for Cho Dan on June 18, 1969. 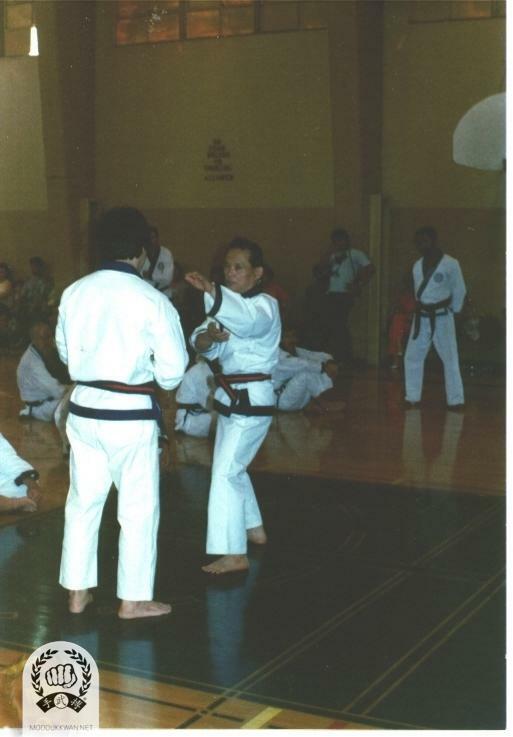 Now a certified 4th Dan Ko Dan Ja, and was issued his original testing date Dan Bon 13927 by Kwan Jang Nim H.C. Hwang based on his petition to honor that date and evidence showing Mr. Mike Masley and his instructors, Mr. Robert Sohn, Dan Bon 6037 and Mr. Vincent Nunno, Dan Bon 7291, were legitimate representatives of the Founder, and Kwan Jang Nim Hwang Kee and the Korean Soo Bahk Do Moo Duk Kwan Association in 1969.